1) Can you describe the project? “In the Present Moment: Buddhism, Contemporary Art and Social Practice” is a major, multi-phase, research and exhibition project that looks at aspects of Modern Buddhism—Buddhism as it is practiced today— and examines its relationship to modern and contemporary art in North America. Buddhism has had a significant impact on developments in the visual arts in the US and Canada, but, this influence has barely been explored by critics and art historians. My research will take an interdisciplinary approach to looking at how artists draw on Buddhism to inform the ways by which they think about and make art. 2) Why were you drawn to this project? The AGGV was invited by the Robert H N Ho Family Foundation to submit a proposal for innovative projects on Buddhism and art. I’ve curated several projects related to Buddhism in the past, both historical and contemporary. This project extends from that background but allows me to pursue a new, largely unexplored territory of art historical and curatorial research. 3) In what capacity will these grants assist your research? These grants enable me to do the research. The starting point is the AGGV’s collection, but because of the scope and “originality” of the project, I have been traveling to research in artists’ archives, for example at the MoMA in New York, and at the Smithsonian’s Archive of American Art in Washington DC. I will also be meeting with working artists, undertaking studio visits and hosting visiting artists’ research residencies in Victoria. I am currently planning for a research convening to take place next fall in partnership with the Fine Arts Department at the University of Victoria. This research phase will inform the development of a major exhibition, and a book, and is allowing us to experiment with, and explore some innovative approaches to art gallery education. “The Robert Ho Family Foundation is among the most important private international institutions supporting Chinese arts and culture. The Foundation’s contribution to Haema Sivanesan’s research and by extension the Art Gallery of Greater Victoria is an important indication of the value of the work we are doing.” Jon Tupper, AGGV Director. 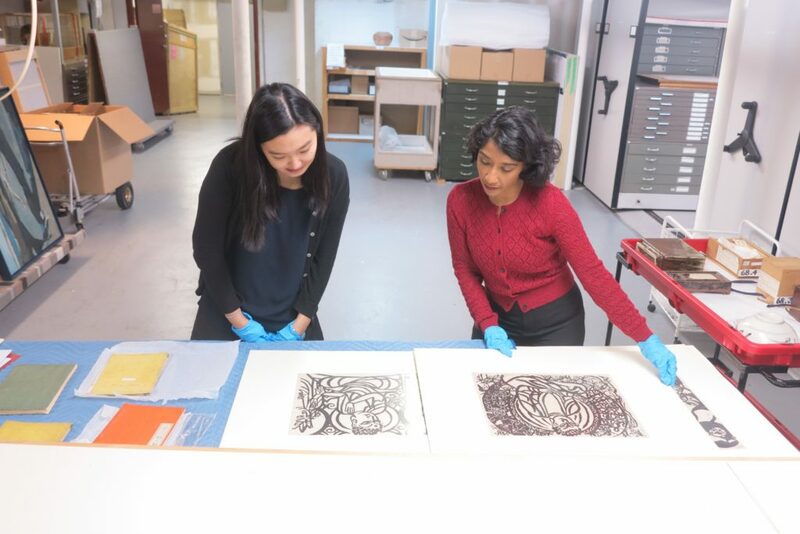 Su Yen Chong (AGGV Research Assistant) with Haema Sivanesan (AGGV Curator) examining woodcut prints by Shiko Munakata. 4) What is your approach to selecting works to exhibit? There are many things to take into account when selecting work: the starting point is the AGGV’s collection, where we have a good selection of work by Northwest Pacific artists including Mark Tobey and Paul Horiuchi. Tobey was one of the first artists in North America to spend time in a Zen monastery in 1934 and was deeply inspired by his experience in Japan. He also attended the first firing of the Mingei pottery kilns in the village of Mashiko with Bernard Leach, with whom he formed a lifelong friendship. Mingei philosophy was informed by Buddhism. From there, the exhibition is art historical and thematic, telling a story about how Buddhism contributed to radical shifts in approaches to the visual arts. Mark Tobey had a significant influence on the avant garde composer, John Cage, urging him to attend the scholar, D T Suzuki’s lectures on Buddhism at Columbia University in New York in 1952. Cage, in turn, influenced a generation of artists who formed the Fluxus movement, which privileged new art forms of performance, ephemeral scores, happenings, and inter-media art. Fluxus included some extremely innovative and provocative Japanese women artists, including, for example, Yoko Ono and Shigeko Kubota. Since the 1970s, Tibetan and various Southeast Asian communities of Buddhist practice have had an impact on contemporary art. The last section of the exhibition will look at the idea of the mandala as a recurring theme in modern and contemporary art. 5) There is a modern debate (especially among westerners) about whether Buddhism is a religion or a philosophy (or a ‘way of life’). What are your thoughts on this topic? This debate about whether Buddhism is a religion or philosophy is specific to the Western context, where modernity is founded on the separation of Church and State and values of secularism. 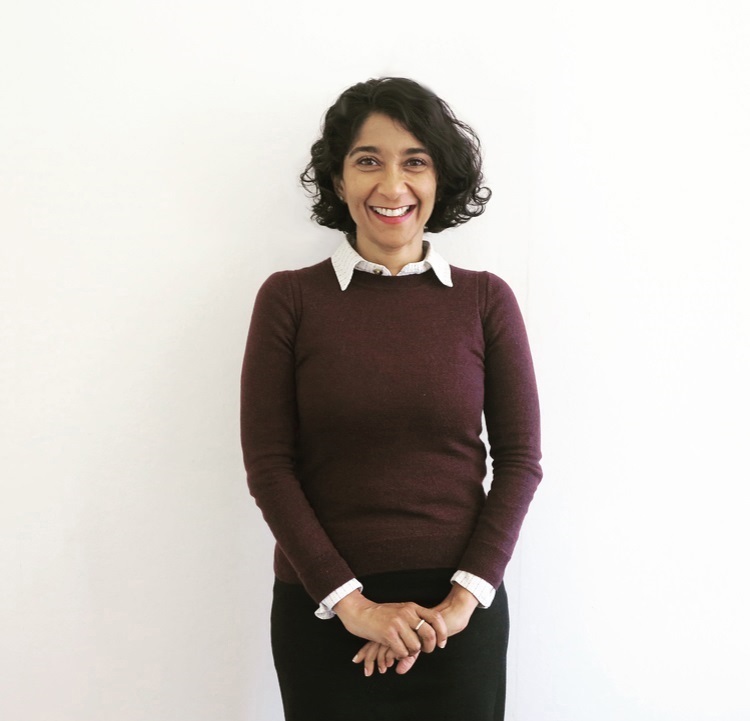 Modernity in Asia is not binarised in this same way and could be thought of as a response to issues and contexts of colonialism, as it grapples with issues of nationalism and political and cultural agency. 6) Why do you think Buddhism continues to have relevance to arts and culture today? I think Buddhism has relevance for contemporary artists because it is a practice of self-discovery and self-transformation. Buddhism is a practice of the mind, of disciplining the mind, to “surpass” the mind. Both the discipline and enigma of this, alongside the ethical and aesthetic potential of Buddhism seem to hold great appeal for artists. 7) In your research thus far, have you discovered anything that has surprised you? If so, why? When I started this project, I knew that Buddhism had had a significant impact on contemporary art. But the extent and complexity of that influence is astounding! This project will be an introduction to that influence, which also speaks to the extent of Asian-North American exchange in the 20th and 21st centuries. The project contributes to better understanding the phenomena of modernism as a history of Asian-North American exchange, where Asian scholars, artists, and teachers had agency to travel, explore, exchange ideas and innovate. Conversely, American artists also traveled and were influenced by Asian ideas. These kinds of cultural and intellectual exchanges that were taking place within a globalizing context are ongoing, and somewhat circular or returning. Developments in the sphere of Buddhism and contemporary art are constantly flowing back and forth between North America and Asia. I would love to develop a parallel project that would take the thesis of this exhibition and apply it to the Asian context, looking at the work of modern and contemporary Asian artists working with the influence of Buddhism. 8) If you could narrow down one message that you would like the public to take away from this project, what would that message be? The one takeaway that I would like the public to have is to gain a sense of the intriguing and unexpected ways in which Asia has had a long cultural impact on North America; and the role of artists in being open and receptive to those influences.